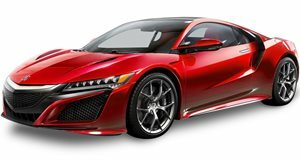 You could walk into an Acura dealership and buy a brand new 2019 NSX supercar for around $160,000. No doubt it’s an amazing car and you’ll drive away very happy. But what if you could spend possibly less money on a barely driven first-generation NSX? Would you do it? Tempting, to say the least. This 1994 Acura NSX has only 187 miles on its odometer and, as of this writing, it has a bid of $126,000 on Bring A Trailer. Its original owner was a collector whose temperature-controlled garage included over 40 cars, all of which had less than 500 miles. This mystery original owner sold his Brooklands Green over black leather interior NSX in 2018 to a dealer for an undisclosed amount. Unlike today’s NSX, first-gen models were not hybrids, but instead came powered by a naturally aspirated 3.0-liter V6 (later a 3.2) with 270 hp and 210 lb-ft of torque. This one is equipped with a five-speed manual instead of the four-speed automatic. A six-speed manual replaced the five-speed when the NSX was refreshed. We’ve previously covered the increasing value of first-gen NSXs and, over time, this trend will probably continue. And this example is no exception. Along with being in literally perfect condition inside and out, it comes with the original window sticker, factory keys, and manuals. It’s also just one out of 34 examples with this exterior/interior color combo for the ’94 model year. Another interesting tidbit: its fixed roof is body color instead of contrasting black. Acura didn’t switch to the latter until mid-way through 1994. Riding on staggered 16- and 17-inch factory wheels wrapped in Yokohama tires, the exterior shows no signs of damage or aging. Everything inside looks stunning as well, with no major signs of wear and tear anywhere. So, which generation NSX would you opt for? The state-of-the-art hybrid or the Ayrton Senna-tested original? We have our pick but it may not be an easy decision for everyone. UPDATE: This 1994 Acura NSX sold for $151,000.